Chronic constipation may be referred to as an unfavorable health condition when a person passes bowels for less than three times in a week. It is a discomforting situation which may also lead to accumulation of toxins inside a person’s body. Triphala is an excellent ayurvedic preparation made of three herbs – Amalaki, Haritaki and Bhibitaki. It is an effective cleanser and removes toxins and microbes from the gastrointestinal tract. It has both purgative and bulk laxative properties and is regarded one of the best constipation cures. Licorice roots are effective against chronic constipation as licorice is a mild laxative. It increases the bile flow towards large intestine. It relaxes the tense and over contracted colon muscles and lets the stools pass. It is beneficial in reducing the muscle spasms. Isphagula seeds can be soaked in water and then consumed. Isphagula has been traditionally used for treatment of constipation as it binds stool, clears it off easily and soothes the mucus line too. Consumption of castor oil is an all-weather herbal treatment of constipation. Castor oil is a natural purgative. Its consumption is safe and causes no side effects. However, it is one of the quick remedies of constipation which is followed by quick discharging of feces. However, one must be careful with usage as frequent use may increase risk of dependency. Chicory is a Mediterranean plant of the daisy family which has natural laxative properties. It softens the stool, cleanses the colon and pushes out feces. Hence consumption of chicory in place of coffee relieves chronic constipation. Buckthorn has purgative properties and works on the phenomenon of causing an irritation to the colon muscles. It is beneficial in clearing the alimentary canal and relieving discomfort. 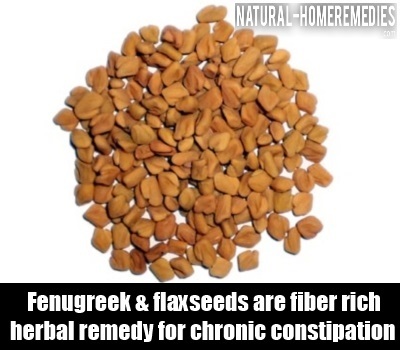 Fenugreek and flaxseeds are fiber rich herbal remedies for chronic constipation. They are particularly effective when the colon muscle has been weakened. By combining with water, they allow the colon to contract naturally, to get rid of constipation and the discomfort arising from it. It is considered to be one of the most effective herbal remedies for getting relief from chronic constipation. Aloe gel acts as herbal stimulant that contains anthraquinones. It is responsible for contraction of colon muscles and pushing out of stool. This should be used only in case of chronic constipation as regular use may cause irritation. Psyllium husks can be acquired from the Plantago ovata plant seeds. Psyllium husks are popular bulk herbal laxatives. They are rich in fiber and help in natural contraction of colon to clear the stool. Also, it is emollient and fresh and does not pose a threat of dependency. The above listed herbs are truly effective in curing chronic constipation without any side effects. However, purgatives may lead to dependency and habit formation. One can get rid of constipation naturally through these, however, if discomfort persists, one must seek professional help.